Saint Catherine was born in Italy to a noble family. She became a companion to a princess at a young age and received a very fine education in all of the arts. When the princess was married, Catherine became an Augustinian nun and later joined the Poor Clare nuns. Catherine became so close to Jesus, that she was inspired with a permanent joy that couldn't be soured no matter what. Her joy spilled out in any artistic project she undertook. She wrote books and poetry, played the viola, illuminated manuscripts, and of course, painted. She passed along her joy to the other sisters in the convent, so that with Catherine as their abbess, their hearts danced and soared towards Heaven. Catherine is a great example of what a person can do if he or she gives their heart completely to God and doesn't let the world sour their joy. Her feast day is March 9. Some Franciscan saints led fairly public lives; Catharine represents the saints who served the Lord in obscurity. At the age of 17, she joined a group of religious women in Ferrara. Four years later the whole group joined the Poor Clares in that city. Jobs as convent baker and portress preceded her selection as novice mistress. In 1456, she and 15 other sisters were sent to establish a Poor Clare monastery in Florence. As abbess, Catharine worked to preserve the peace of the new community. 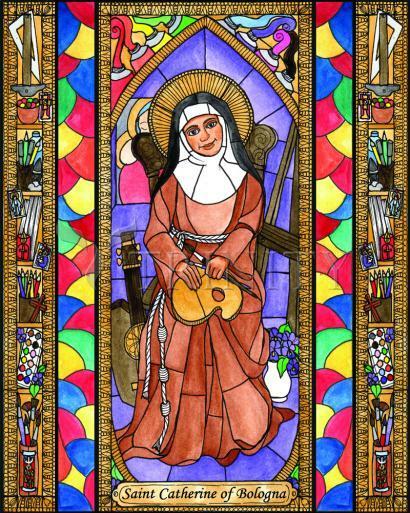 Her reputation for holiness drew many young women to the Poor Clare life. She was canonized in 1712.